EVEN before the government said it would need until 2023 — two to three more years than initially planned — to reach its zero fiscal deficit target, a number of economists had already expected as much. They also do not expect the country to pare down its debt substantially, if at all, in the coming five years. One even points out that Indonesia’s budget deficit just came in lower than expected at 2.6% in 2017 — the kind of positive surprise that remains elusive here. They can hardly be blamed for their scepticism. Malaysia’s fiscal deficit — which arises when the government spends in excess of what it earns that year — had halved from 6.1% of gross domestic product (GDP) in 2009 to 3% of GDP last year, and is targeted to reduce further to 2.8% in 2018 — the lowest since 1998. However, the actual fiscal deficit amount still remains high at RM39.79 billion for 2018 compared with 2017’s RM39.89 billion. The excess spending (also known as budget deficit) doubled from about RM20 billion a year in 2003-2007 to RM34 billion in 2008, peaking at nearly RM44 billion in 2009, before improving to RM35.17 billion in 2015, only to go up again. Malaysia last had a budget surplus more than two decades ago in 1997 when it spent RM8.2 billion less than it earned. As a result of excess spending, federal government debt has grown an average of 10% a year over the past 10 years to reach RM687.43 billion as at end-September 2017, from RM266.72 billion in 2007. In fact, the annual growth averaged 10.8% a year between 1997 and 2017. Similarly, operating expenditure grew an average of 6% a year in the past 10 years to RM219.91 billion in 2017 from RM123.1 billion in 2007. That’s above the average 4.9% a year that the country’s revenue has grown over the last decade, to RM225.34 billion in 2017 from RM139.9 billion in 2007. If federal government debt is allowed to continue growing at the rate it has in the past decade, it could reach RM1 trillion by 2021, RM2 trillion by 2028 and RM3 trillion by 2032, back-of-the-envelope calculations show. Already, debt service charges have risen from RM6.4 billion in 1997 (9.8% of revenue) to RM12.9 billion in 2007 (9.2% of revenue) and RM28.87 billion in 2017 (12.8% of revenue). This year, debt service charges are projected to reach RM30.88 billion, or 13% of government revenue — that’s RM2.57 billion every month, RM593.9 million every week, RM84.6 million every day, RM3.5 million every hour, RM58,756 every minute and RM979 every second. And that’s just this year. The RM86.3 billion required for debt service charges in the most recent three years (2016-2018) is 1.5 times the US$14.5 billion (RM58 billion) net worth of Robert Kuok, according to Forbes billionaires’ real-time list on Jan 3. In fact, except for Kuok, the 2018 debt service charge alone is more than the net worth of each of the other Malaysian billionaires on the same Forbes list (see infographic on Page 51). That RM30.88 billion is enough to give RM1,075 cash to all 28.7 million Malaysian citizens. If the 3.3 million non-citizen population were also given a share, everyone would get RM964 each. It is also 4.5 times the RM6.8 billion allocation for BR1M this year and is enough to pay 8.6 times the toll compensation to PLUS (RM2.2 billion) and MRCB (RM1.4 billion) for abolishing four tolls this year. From the revenue perspective, it is 96% of the estimated RM32.2 billion personal income tax collection and 71% of the estimated RM43.8 billion collection from the Goods and Services Tax (GST). The amount would be enough to build seven second Penang Bridges, the RM29 billion Pan Borneo Highway, cover nearly 60% of the cost of building MRT1 and 2, construct hundreds of schools or at least 36 hospitals the size of the new RM848 million Women and Children Hospital Complex with 600 beds within Hospital Kuala Lumpur. It is also sufficient to give all civil servants and pensioners at least three months’ bonus or forgive nearly two-thirds of the RM48.6 billion study loans given to 2.6 million students by the National Higher Education Fund Corporation (PTPTN) from 1997 to 2016. To be sure, a big part of the debt spiral is because the federal government’s operating expenses have grown 6% a year in the past 10 years — faster than the growth in its revenue. For every ringgit the government earns, 98 sen goes to paying operating expenses such as salaries, pension, subsidies and other upkeep items. That leaves little option but to borrow to fund development expenditure, which is necessary to maintain the country’s competitiveness and secure its future growth. 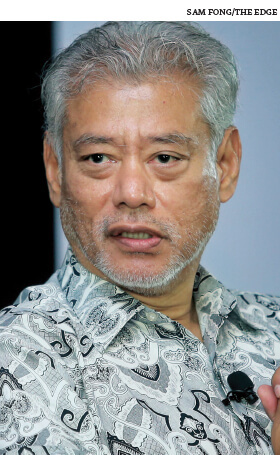 “What Malaysia needs is more development expenditure, not operating expenditure, where the country invests in needed infrastructure and human resource development,” says economist Professor Jomo Kwame Sundaram. Ironically, the RM30.88 billion debt service charge is also about 78% of this year’s fiscal deficit. About RM75.7 billion of government debt will mature this year, higher than the RM71.3 billion last year, according to economists at AllianceDBS Research. Between 2018 and 2022, a total of RM363.7 billion or 51.9% of total debt is set to mature. “However, its indebtedness level is not expected to be pared down substantially in the coming years,” says the team’s Jan 5 report. Endorsements by global sovereign debt rating agencies mean there is no immediate worry that Malaysia will not be able to honour its debt obligations. Still, the maturing debt papers could spell new borrowings, likely at higher cost, with interest rates “normalising” across the globe. Bank Negara Malaysia too is widely expected to raise its key overnight policy rate by 25 basis points this year. That could mean more money to service debt in the future, unless something is done to significantly reduce the total outstanding debt. One way is by selling assets — something that has been done by the Ministry of Finance Inc-owned 1Malaysia Development Bhd (1MDB), which reportedly had RM50 billion in debt in 2016. Although 1MDB is wholly owned by the government’s MoF Inc, the former’s debt is not counted as part of the federal government debt of RM687.43 billion (51.1% of GDP) as at end-September 2017. The portion of 1MDB’s debt directly guaranteed by the government would fall under the pool of government-guaranteed debt of RM226.88 billion (16.9% of GDP). As at end-2016, debt with direct government guarantees stood at RM187.23 billion, of which RM5 billion was from 1MDB (30-year bond) and RM699 million from TRX City Sdn Bhd (formerly 1MDB Real Estate Sdn Bhd). There was also RM4 billion from its former subsidiary SRC International Sdn Bhd that was transferred to the MoF in 2012 (see table on Page 49). The 10-year US$3 billion bond with a “letter of support” from the MoF that was the subject of much debate in Parliament in 2014, for example, does not fall under this pool because the letter is not a direct guarantee. This has been questioned because the letter of support means the government would step in to make sure the issuer’s obligations are fully met, if necessary. According to Bloomberg data, 1MDB has RM29 billion debt outstanding with maturities from 2018 to 2039. In January 2016, the government transferred RM21.9 billion of civil service housing loans off the balance sheet to the Public Sector Home Financing Board (LPPSA), a statutory body. Under the government-guaranteed debt list, only RM4 billion showed up under LPPSA in 2016. Questions have also been raised about MoF’s Pembinaan PFI Sdn Bhd, whose nature of business is to “source financing to undertake government projects” and which had reportedly been given a RM25 billion loan from the Employees Provident Fund guaranteed by government-backed land leases. Latest filings with the Companies Commission of Malaysia show Pembinaan PFI had RM19.48 billion “unsatisfied charges” from the EPF. Pembinaan PFI had total liabilities of RM28.75 billion versus RM28.79 billion total assets in FY2014, filings show. This is also not found on the government-guaranteed debt list between 2008 and 2016 — or what some experts call “off-balance sheet” borrowings and obligations. “One problem [which needs to be addressed] is a lot of the infrastructure spending has been taken off the federal government budget, which reduces transparency and accountability, not just to Parliament, but also to the public,” says Jomo, who reckons that all sizeable government-led infrastructure and development projects should be scrutinised by an independent bipartisan parliamentary committee chaired by a member of the opposition party. Separately, the group of 25 (G25) former high-ranking civil servants and prominent Malay figures, had also, in a recent report titled “Invigorating Economic Confidence in Malaysia”, advocated stronger Parliamentary oversight to safeguard the public interest by setting up parliamentary select committees and special select committees with oversight functions. These committees, they say, should be adequately funded, independently staffed and empowered to undertake special investigations. “Many questions have been raised on how the East Coast Rail Link (ECRL), for example, helps the economy and the people … Rigorous cost-benefit analysis of large infrastructure projects is needed to establish what are priorities. Not all infrastructure necessarily pays for itself but can be justified if the benefits sufficiently accrue to the people and the economy. [We do not want] infrastructure projects that exist just to give out contracts to influential contractors, that is, ‘jobs for the boys’. And the ECRL is not even for Malaysian contractors,” Jomo adds. Some 70% of jobs for the RM55 billion ECRL will reportedly go to Chinese construction companies, which significantly reduces the multiplier effect on the local economy, experts have said. Some 85% of the project is financed by China’s Exim Bank, with the remaining 15% or about RM8.25 billion from sukuk issues. In the first nine months of 2017 alone, debt guaranteed by the federal government jumped 21% or RM39.6 billion to RM226.88 billion as at end-September 2017, from RM187.32 billion at end-2016. This is more than the 5.4% year-on-year increase in 2016 and 3.3% rise in 2015. The highest quarterly increase was RM21.7 billion in 2Q2017, followed by RM9.5 billion in 3Q2017. It is not immediately known whether ECRL-related costs are the reason for the jump as the detailed list of companies with government-guaranteed debt for the whole of 2017 will only be available when the federal government releases its detailed expenditure list for 2019 later this year. Another major infrastructure project that is underway is the RM29 billion toll-free Pan Borneo Highway project in Sabah and Sarawak. When asked about the 16% jump in the first six months of the year at the recent third-quarter GDP press conference, Bank Negara Malaysia governor Datuk Muhammad Ibrahim said the increase was due to “infrastructure-related” spending. It is also worth noting that Bank Negara on Jan 4 announced it was buying land from the government for RM2 billion for a financial education hub. The statement did not say what the government will use the proceeds for. When asked about contingent liabilities and the recent rise in government-guaranteed debt, Andrew Wood, a sovereign analyst at S&P Global Ratings, says his firm takes a holistic approach to assessing contingent liabilities. The latter refer to obligations that have the potential to become government debt (and affect credit standing) should they materialise — some of which “may be difficult to identify and measure” but can generally be grouped into three broad categories: financial institutions’ contingent liabilities, contingent liabilities related to non-financial public sector enterprises and guarantees and off-budget contingent liabilities. “What is notable in Malaysia’s case is that the consolidated finances of Malaysia’s non-financial public companies reflected a deficit equivalent to 4.1% of GDP in 2016, following a shortfall of 4.9% in 2015. This is suggestive of some quasi-fiscal activity at state-owned firms, which could give rise to elevated contingent risks in the future,” Wood says in an email reply. “We do note that capital and, more specifically, infrastructure spending is a significant driver of this trend. The ongoing development of Malaysia’s infrastructure should enhance productivity over the long term, solidifying and potentially raising its potential economic growth rate. Nevertheless, debt metrics may continue to deteriorate over the near-to-medium term,” he adds. S&P currently rates Malaysia an investment grade A- with a stable outlook. In a June 22 report, Wood notes the country’s “sizeable stock of public debt” but says S&P’s rating reflects Malaysia’s “strong external position and monetary policy flexibility, as well as sound growth prospects”. “We weigh these strengths against the Malaysian government’s relatively weaker debt position and moderate, albeit improving, level of economic development,” the report reads. “Ongoing political challenges in relation to the corruption allegations of 1MDB, combined with the approaching election, pose potential challenges to the sovereign rating over the near-to-medium term. Those challenges could manifest themselves via a rise in the cost of refinancing Malaysia’s sizeable gross external financing needs, or via non-resident outflows from Malaysia’s deep local-currency government bond market. However, our ratings are based on the belief that these challenges will not materially impede policy flexibility and responsiveness,” S&P says, noting the Malaysian economy’s resilience in the face of headwinds beginning late 2014 and commends how the country effectively managed the oil price shock of 2014 and 2015. S&P also says it may raise Malaysia’s ratings “if stronger economic growth, combined with the government’s fiscal efforts, lead the government to reduce the level of public debt to GDP substantially, for example if the government started paying down outstanding debt.” Conversely, S&P says it may lower ratings “if we assess Malaysia’s public finances or institutional settings have weakened [or if] contingent liabilities increase substantially”. It is worth noting that S&P, in its June 22 note, regards the US$3 billion letter of support for 1MDB “as a direct financial obligation of the government” and is therefore among the contingent risks it takes into account when arriving at Malaysia’s sovereign rating. In other words, rating agencies already count Malaysia’s broader debt to be more than 68% of GDP. Rather than leaving room for speculation, it is high time that contingent debt obligations such as the US$3 billion 1MDB debt be recorded under a regularly updated public register, just like the list of government debt and debt that is directly guaranteed by the government. The recent rise in oil prices, while potentially painful for consumers at the pump, also spells higher oil revenue for the government. It also provides extra revenue headroom to improve the country’s fiscal position and prove the sceptics wrong. Just as measures that improve transparency and accountability would likely be rewarded, a slide in fiscal position would come home to roost.